beeconcise | a ruth andrew blog. finally! a place to put all my words. A few years ago, on a warm Sunday morning in a Georgia garden, my daughter, Allison, gave me a book for Mother’s Day that changed my life. Women Who Think: Tales of real-life Parenthood, edited by Camille Peri and Kate Moses of SALON Magazine. It followed women struggling to regain their spirits after divorce or other hardships. “I gave you that book in hopes that you’d get back to your writing,” she told me. “Oh. I thought you gave it to me so I’d get back to my thinking,” I said flippantly.“Well, that too!” We were on the same page. It was hard to admit, but I’d given up writing, thinking, being … Newly divorced, I went to work everyday, came home, went to sleep, and got up the next day to do the same thing all over again. What I realized in reading the first few chapters of this book, this wonderful gift from my daughter, is that I’d given up hope. And I didn’t even know it. Years before I’d tucked my writing dreams into a bottom drawer of my life during the sad breakup of a twenty-three year marriage. After selling many short stories, humor essays and non-fiction magazine articles, I no longer had energy for any of it. My new working routine drained me of any spark of creativity that ever existed in my body. And writing? Big joke! At the time an editor at Avalon in N.Y. wrote to ask me to write a hard cover teen romance, and an editor at Good Housekeeping wrote to ask me if I’d be interested in editing a short story (“Blueberries”) that they were interested in publishing. Both letters came within days of each other. I tossed them both into a large packing box with other papers from my home office, and found the box some ten years later. I Just kept packing moving those boxes to move out of our family home. It seems so long ago. But now, with this book in hand, I boarded the plane for my flight from Atlanta to my home in Spokane, not the least bit ready to return to work the next day. I began reading the book the minute the plane took off, and finished the last page when my last flight touched town in Spokane, hours later. Reading this new book was a powerful elixir for me, and started my juices flowing again. I thought they’d dried up. By the time I pulled my car into the garage late that afternoon, I knew I’d begin writing a memoir for my kids. And maybe more. Within a week of returning to Spokane I read an announcement in the Sunday paper for a class on “Recapturing the Creative Spirit” at a Barnes & Noble bookstore only minutes from where I lived with my new husband. Just the ticket I needed. I decided I’d give this class to myself as a birthday present. Excitement began to flow through my veins. This was especially meaningful because years earlier, long before my divorce, my husband had told me I hadn’t been good enough one year, that I didn’t deserve a birthday present. I hadn’t realized until this moment how painful those words had been. Friends would say, “Get over it. Time to move on,” but easier said than done. Yet this class I gave to myself, this self-given birthday gift, blew all the other gifts out of the water, in more ways that I could even imagine. The very next evening on the way home from work, I stopped at the bookstore to enroll in the class. After signing up I found my way to the book shelf that held the suggested text, The Artist’s Way by Julia Cameron. Opening the first page of this book was literally a matter of opening the first page of a new life for myself. Reading the back cover alone soothed me like someone with Strep throat who’s finally gotten hold of penicillin. I sat down on the floor at Barnes & Noble, in-between the aisles. My purse and jacket landed in a pile beside me. People stepped around me. I hardly noticed them except to occasionally move my foot out of their way. I sat there and read the first two chapters and forgot all about dinner. Within days I began writing the suggested morning pages. A friend, who later became a writing mentor, told me I was writing like I’d been shot from a cannon. It felt like it, too. Later that summer I started a gardening journal, noting when the iris bloomed, when I found a bird’s nest, when the lilac burst forth in color, and when I needed to separate the chives. This was the summer the oregano tried to take over the garden. This was also the year the peonies finally bloomed, after years of lying dormant. Everything was alive, including me, and I had it all down in my journal! In the months that followed I quit one job, found a new one, and began to write more than daily journal entries. I wrote essays, sketches, bits for a memoir ~ every word feeling like infection oozing from a boil. Breathing became easier. That fall I began to write my first novel, about a woman who cuts all of her strings, emotional and otherwise, and moves to Benson’s Cove, a small seaside community on the coast of Washington State’s Whidbey Island, to help her Aunt Tilly with her bookstore. It was a matter of dreaming up an ideal life for myself, and I couldn’t think of a better new beginning. It’s fun, gratifying and amazing to know that I’ve imagined a whole new life for a character who slipped into my mind one day during a long, hot shower. Soon there were more characters ~ a whole community full of people living in my mind, all with problems in their lives much larger than any I’d encountered, but none that flattened any of my characters the way I’d let a divorce and broken family flatten me. Sometimes driving to work now at a job where I only work part-time, to give me more time for writing, I have complete conversations with the residents of Benson’s Cove. One day I caught myself wondering if writing a novel is a bit like having a nervous breakdown, where you aren’t sure what’s real and what isn’t. It’s okay, I told myself. You’re not crazy. You’re just a novelist! My protagonist has a moment of realization, digging in her garden one summer day, when she pulls up a chrysanthemum plant with slugs swarming among the roots. “That’s it,” she said out loud to herself, holding up the pitiful plant. “This is what my life has become. A pitiful plant where I allow other people to feed off me. I have no direction for myself!” With that she dumps the plant into trash, and adds a healthy dose of slug killer to the garden. The next day she resigns the job she hates, then phones her Aunt Tilly and accepts her offer to move to Benson’s Cove for the summer to help with her bookstore. In two weeks flat she’ll be in Benson’s Cove, but only after she breaks an engagement and infuriates her family. Typing the title of the novel on the first clean, crisp piece of paper opened a wound in my heart. One thing I’ve discovered is that writing is the best therapy I’ve ever encountered. This fall I plan to attend a writing conference with a copy of my first novel, Benson’s Cove, tucked away in a large file folder in my home office, which my new husband makes sure is always stocked with copy paper. Everything there works like a charm: computer, printer, and even me. Having the support of someone I love and who loves me seems to be the necessary ingredient for my life to move forwards. I’m happy to say I’m at my computer by 5 a.m. each morning, writing to my heart’s content. This October, now that I finally live in Georgia where my daughter moved, I plan to attend the GA Romance Writers’ Conference with a synopsis of my novel in my hip pocket, and big dreams sitting on the top of my desk. Trying to live without writing for me would be like a fish trying to live out of the water. Like the peonies in my garden, I needed care, something I hadn’t given to myself in years. Just like a plant, I needed mulching, water, sunshine, and occasional raindrops falling down around me. For me, writing is an essential nutrient. Only with this self-care care am I able to bloom. I used to think that if I were a flower, I’d be a pale pink azalea, but I’ve changed my mind. I am beginning to suspect that I might be a bright and lovely peony, bursting forth in glorious color with the first hot breath of summer. At least that’s what it feels like inside of me now. It’s hard to imagine that I once thought I could live without writing, or that I’d put this on a back burner in my life for so long. How could I even think I could cut this out of my life? It was as if a part of my life had been lost in a tragic fire. My daughter was right. The book she gave me did get me back to my writing. It also got me back to my thinking, and a whole lot more! I was only ten years old, living in a small town in the Florida panhandle, when I first met Leroy. The year was 1951. 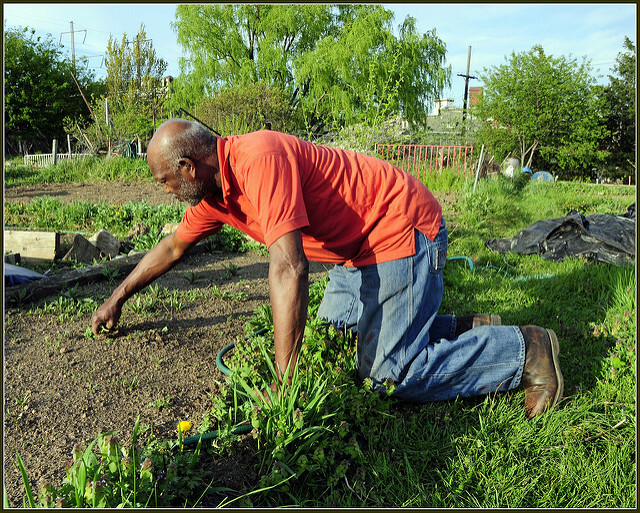 Leroy was an old, silver-haired black man – tall, thin and quite bent – who came to my mother’s house each Saturday to work in the yard that year. He started working for our family sometime around March, after the azaleas bloomed. Each Saturday he wore pressed jeans and a fresh white shirt that would be covered with red dirt at the end of the day. It never occurred to me to find out how Leroy arrived, or how he left. There was never a car in the driveway. He was just there, out in the back yard where he was supposed to be, when I’d wake up on Saturday mornings. I never saw him leave, either, or knew when he left. It never once occurred to my young mind that it might have been difficult for him to get to our house. He was just there, where I knew he’d be, in our back yard. After having breakfast I’d get myself dressed for the day, mindful of the Florida heat. I went barefoot, except on Sundays for church. Each Saturday morning my little black and white English bulldog, Queenie, waited by the cool back concrete steps in the garage for me to come swinging out the back door to grab my blue bicycle with the white basket, complete with pink artificial flowers around the front. I felt like a princess when I climbed onto my beautiful new bike. Queenie would try to hop up but of course couldn’t, but she loved to go for rides with me in the basket. I’d lift her up, place her in the basket, sometimes wearing my doll’s clothes with a baby’s bonnet tied around her small head, and off we’d go. Our favorite mission was to ride to the corner grocery store, two blocks away, to buy two loaves of Wonder Bread for my mother. This seemed to be the thing I was supposed to do with my Saturday mornings, just the way that Leroy worked in our yard every Saturday. We’d put the bike away, Queenie and I, and go say hello to Leroy. He’d smile his wonderful big grin, stoop down to pet Queenie, and then pause to wipe the sweat off his brow. It was always with a clean handkerchief from his pocket. Leroy didn’t have all of his teeth, but that didn’t matter to me. He had all of his heart and that’s all I cared about. “Good morning, Miss Ruthie,” he’d say to me. “And good morning to you, too, Miss Queenie.” I’d smile and Queenie would wag her tail. We loved being with Leroy and would help him with the yard work. I helped more than Queenie, of course, but she was very good at supervising. We’d pick some beans, rake up pine needles, mulch in the flower beds, and do anything else Leroy thought needed to be done. One particular afternoon, after Leroy had been there several hours, my mother called to me from the kitchen. “Ruthie, come wash your hands for lunch and tell Leroy his lunch is ready.” I quickly did as asked, washed my hands for lunch and went to get Leroy. “Lunch is ready. Momma says to come on and eat.” I held the back screen door open. Leroy looked at me with his big brown eyes, the whites faded now to a pale yellow. He shook his head from side to side, saying no. He wasn’t taking one step into the house. “Yes. Momma says lunch is ready. Come on. We’re gonna be in trouble if you don’t come on.” I grabbed his hand and pulled him up the steps, through the kitchen and into the dining room. 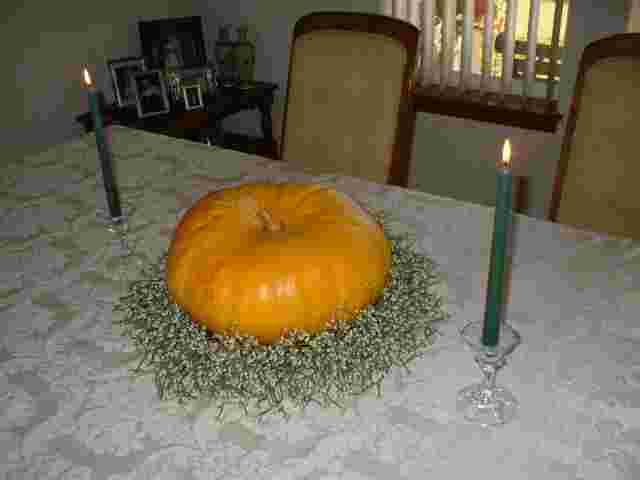 It was then that my mother came back into the dining room from the hall way. Only then, when I saw the look of shock on her face did I realize the truth. That Leroy was not supposed to be standing in her dining room. That I was in trouble for bringing him inside. And that we were both, just as he’d predicted, in a mess of trouble. Leroy turned to go. I felt like asking him didn’t he care that I got slapped, but I guess he was just glad that he didn’t get slapped. The tears spilled down my cheeks. I went out the back door with Leroy. He was the only friend I had, other than Queenie. Leroy sat down on the back steps. He put his hands together, as if he were praying, then hung his head. I just cried. Queenie came to lick my hand. My mother opened the back door, nearly pushing me off the step when it opened. She handed me a plate of hot collards and buttered cornbread, and a glass of cold iced tea. “Here. Give this to Leroy. And tell him to stay there and eat. You come in now and get your own lunch.” She didn’t seem a bit sorry she’d slapped my face, and I still didn’t know why. I handed the plate to Leroy. There wasn’t a napkin. “I’m sorry, Miss Ruthie,” he repeated as he took the plate. “It’s okay, Leroy. I’m sorry, too.”I opened the screen door, leaving him there with Queenie, to begin eating his lunch. In a few minutes I opened the screen door again, this time with my own plate of collards and cornbread in one hand, with two napkins and my glass of iced tea in the other. Leroy smiled at me and shook his head again. I smiled, too, and sat down on the back step beside him. That step always felt cool, especially when I was barefoot and wearing shorts, but that day it felt especially cold. I handed him a napkin. I leaned over and bumped him on the shoulder, making him laugh. He shook his head. I laughed too. I could swear Queenie wagged her tail. As it turns out, I did care about the lessons I learned that day from my mother. They just weren’t the lessons she wanted me to learn. Leroy never came back to our house after that day and my mother never mentioned him again. Had I known then at my young age just how much it had taken for this kind and bent old man to show up at my mother’s door step every Saturday, in his clean, ironed white shirt and pressed jeans, with the way he had been treated and the lack of respect shown to him by my family, I might very well have slapped my mother right back. I only wish he could know how much he had impacted my life, and wish with all my heart I could sit down with Leroy once more and read him my story. For Christmas this year grandson Asher gave my husband a book on birds ~ What the Robin Knows, by Jon Young. We enjoy feeding birds at our house and already have five feeders in the back yard that are continually emptied and refilled. I have ‘Bird Seed’ on my grocery list as often as I have milk, butter and eggs. I’ve decided to read a bit of this charming book myself every evening. I’ve found that the Robin is the back yard sentinel, with alarms and alerts that are called out to other birds when predators or intruders are about – cats, dogs, hawks, squirrels, even man. Each bird has several different sounds they can make, including sounds of alarm. Who knew? The book says the robins sit high in trees so they can survey a wide area of landscape, always watchful for intruders. Some birds that nest on the ground need this kind of overview protective warnings. I’ve also learned that black birds are a first cousin of the robin – a black bird is a robin that is black. Do I think this book is amazing? The answer is definitely yes! A couple of things I’ve learned about birds from this book are funny. Last May we had a Mocking Bird nesting in our Japanese Maple at the front door, near my office window where we have a twin bed for company. A friend visiting from Spokane said ‘that bird’ kept her awake. I laughed today learning a Mocking bird is a bird that will chirp and squawk as much as 16 or 17 hours a day and sometimes more. I told my friend we should never again have a guest in that front bedroom in May! Another thing I’ve learned from this book is how necessary it is for birds to conserve energy each day. The author asks the reader to imagine ‘living off of the landscape’ around our houses,which is what the birds must do daily – live off of the landscape. If a bird is frightened and takes a sudden flight away from its roosting place for the night due to an encroaching predator, it will expend so much energy that a small bird like a chickadee might well be dead the next morning. That’s an alarming thought but makes me more aware of being quiet and careful around birds. I am enjoying this book so much I’ve started making notes to type up and share. And I am not even finished with the first chapter. I can’t think of a better Christmas gift, ever! Thank you, Asher. You pick out wonderful Christmas gifts. After Christmas this year we had more Christmas gifts in the china cabinet than china, and didn’t want to put any of it away until next year. The glassed-in top holds two tall snow people, gifts from my friend, Gail, a snowman, pottery Christmas trees, and three Humble figurines. 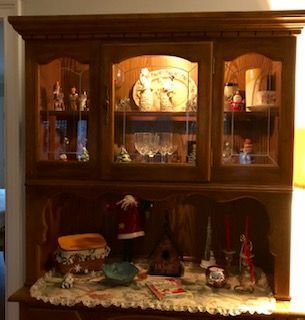 The lower hutch shelf holds a Santa, red candles, a glass ornament on a stand, a Frosty the Snowman candle snuffer, my favorite Christmas book, Applause for Mrs. Clause, and a sweet bird house with a steeple on top that looks like a church. Early mornings when I turn on the light at the top of the china cabinet, I see snow people waking up for the day. Sometimes I move the chubby snowman down beside the church, or move him over to one of the Christmas trees. To me it’s become my very own Christmas Village with a Santa in one window, Christmas tree in the other, snow people in the middle, and a church below, waiting for Christmas Eve services. Santa could join the snowman one afternoon for some fun in the snow, or he, the snowman and children standing watch on the top shelf might all go to church together. I can almost hear them singing Christmas carols. When my daughter was small, she kept putting her Fisher Price school bus driver in the middle of the Nativity scene in our family room. I’d move him back to the school bus, but there he would be again that afternoon, next to the camel and the sheep, or wedged in next to the manger – three wise men and the bus driver. Since then, with AF family moves, our nativity scene fell apart and the bus driver was lost. I never had a doll house, but love this two-story Christmas Village. My daughter, grown now, has a twelve year old son who loves Legos. I wouldn’t be surprised to one day find a Lego person standing beside the manger next to the snowman and the children. It is definitely time for a new Nativity scene at our house. For the first time I understand why my daughter kept putting the bus driver next to the manger of Jesus. Evcn at five she simply knew he needed to be there. Now I understand, too. Looking back over these blogs since 2010 when my daughter, Allison, first developed my web site, I am amazed at how few blog posts there were from me for the months of November. I suppose I was deciding how many chairs to fit around the dining room table, which kids and their families would sleep where, did I have enough sheets, towels, dishes, etc., those little details that can keep moms awake at night. Our son and his family came usually every Thanksgiving, with daughter from Georgia coming mostly in the summer for visits with her family. 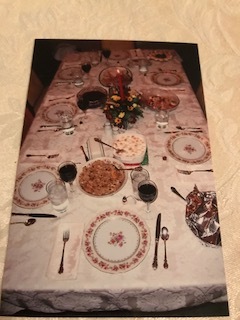 As the kids grew older, my husband and I joined son & wife for Thanksgiving at their home about two hours from where we live, as their daughters began college and wanted to visit friends at home over the Thanksgiving break. But those were some of the sweetest memories I have of family times ~ laughter, late pajama mornings, & the Thanksgiving parade. Now we live in Georgia, moving from Washington State to the Peach capital of the world. Weather is amazing, even on those hot August days, and the garden enjoys the sun and more rain than I ever knew would fall in Georgia. We’ve bought a smaller house with a tiny amount of housework to be done. I am more thankful for that than anything else. It’s like anything else is life ~ sometimes more is bigger, better, more exciting, but it always comes to us with a cost. Housework as I get older is no longer my friend. 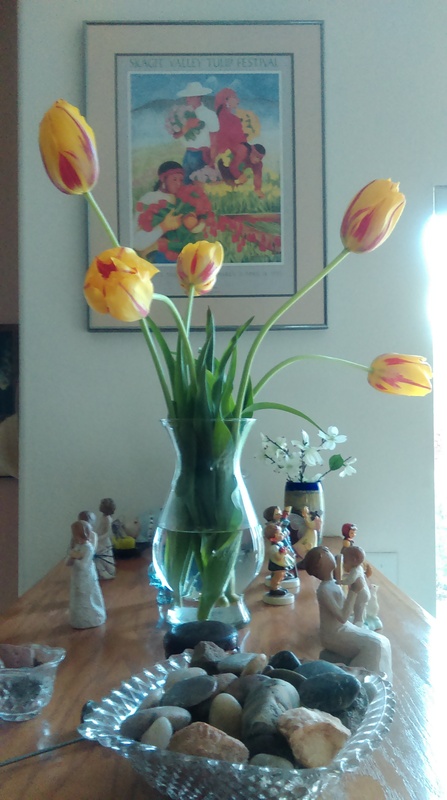 I am happy to have hubby vacuum and care for the hard floors, and as for me – me … time to read, knit, garden, jot notes to friends, and maybe finish my novel I’m always writing. We still enjoy family for Thanksgiving, but I may never put a second leaf in the table again. I’ve decided dinners need to be easier, more simple. Am working on this. I think back to the meals my grandmother cooked. Mama Ellis was a southern cook who could whip up pecan pies and coconut cakes without blinking an eye, and none of us has ever duplicated her Chicken & Dumplings, although I’ve tried. I am thankful for my childhood, the lessons learned, & growing up with family in Pensacola, Florida. Here’s a poem I wrote about Mama’s Sunday dinners. If you were not at the table 20 minutes after the church sermon ended, you’d be counted as late to dinner. There’s tender roast beef, gravy. hot biscuits and peach pie. his hands and bows his head. drops his chin and fall silent. We open our eyes around the table. A chill races the room. Oh, no, God. Please not here. Not now at Sunday dinner. begin our dance of food. and we are once again filled. with the crumbs beneath the tale. Days are getting shorter, with Daylight Savings on the way again, and there is that special chill in the air. A year ago we hoped to still be in Spokane, WA for our last October there, with the magnificent colors of Spokane on display but we found ourselves already having completed our across-country move to Georgia, and were already entrenched in our retirement home in Colbert, GA, known as a one-mile town. Instead of the hundred-plus children in costumes who knocked on our door for candy while we lived in Yale Court, Spokane, we had three children in costumes at our door last Halloween, here in Colbert, GA. We still live in a cull d’ Sac, but it’s different. Same number of homes. Far fewer children. In Spokane parents loaded up kids in soccer vans and drove to our area for lots of candy and fun. Here we live near a busy highway and nobody drives kids around for candy. My Halloween memories are beginning to fade, but three in particular always come to mind for me. The first was our son at KI Sawyer AFB, Michigan, not even two years old, trick or treating with his friends belonging to my Best Mommy Friends, Gail and Donna. We sent Becky, Phil and Eric out for their first big Halloween night – a witch, a ghost and a cowboy. All with wide eyes and stories to tell later. The next is the year my children’s dad was in Thailand with the AF. I have a picture of our little daughter, then nearly two, in a blue bunny suit and bunny ears, holding hands and pumpkins with her five year old brother in his Zorro costume, complete with hat and mask. Does not get much cuter than that for me. The most special memory of all for me is the year I made our daughter an angel costume for Halloween when she was in first grade. She had long brown hair with golden highlights from summer, her white angel costume trimmed in gold braid, and a bright, shiny halo for her hair. It was her day to lead her class to and from the water fountain, recess & lunch. It was also the day her class room was assigned to lead the entire school in their Halloween Parade around the block, to cheers and applause from parents, with all the kids in their costumes. I showed up in time to dress our daughter in her costume and stood with other parents somewhere along the route to see the parade. Imagine my surprise to see our adorable little angel leading the entire school in the Halloween parade. It makes for an awesome memory, and I didn’t even have a camera. With cell phones we all have today, being without a camera would never happen. Now we live in GA close to my daughter and her family, and all still love Halloween. My husband and I have already eaten our way through three bags of Halloween candy & bought more yesterday. After all, we may have at least the same three kids as last year, and it could be more, we tell ourselves standing in the candy aisle. You never know. It could be more. Of course we make certain we’ll have more than enough left over for us! I stood fixed at attention. They were describing me, except for the TV. Five hours is too much even for me, yet I love a good Hallmark movie now and then. Even though I no longer work, and rarely volunteer for anything, life does not disappoint. There’s my African Violet on the kitchen window sill for daily inspection, usually a Good Morning Hello when I fix that first cup of coffee. There are three other plants to water, plus the mum on the back deck, two on the front porch and my mother’s rose bush along the front walk. While I have the watering can out I fill up the flower pot with the fountain in it that my friend Gail sent for my birthday. I can’t forget the raspberries to pick, even in the Fall, and more green peppers in the garden hubby planted. And of course a daily email to friend, Gail. What would we do without our dearest friends, no matter where we live. I count myself lucky to still have a hubby to share things with, but do have to feed him, and he does like a bit of daily attention. We even watch a few detective shows on TV in the early evenings or a PBS series of some sort, and definitely watch Seahawks, WSU & Gonzaga games, even way down here in GA. We still fly our Seahawks flag but a UGA GA bull dog does sit on the front porch. What more purpose do I need? There’s laundry, housework, cooking, shopping – dull routines when we were crazy busy working with kids at home, but now a blessing. I still have work to do and time to do it whenever the spirit moves me. The cherry on top is weekly visits with daughter and family for hockey, soccer and tennis with our grandson, who occasionally spends nights with us. He’s the only one who will watch The Great British Baking Show with us, and sometimes we three play Cribbage & have ice cream. Grandson calls this our ‘Ice Cream Cribbage Club.’ A year ago he told me Georgia people don’t need to use manners. Wrong thing to say to this southern Grandma. We embarked on a manners lesson. Now he thanks me when I hand him a napkin. There’s my purpose right there. There and a whole lot more. Maybe we all need to look at our lives with gratitude for what is left, rather than with tears in our eyes for what used to be. For me, what I have now is more than enough. I feel blessed that I finally realize it.